In the run up to this weekend I'd told Megan that my plans involved visiting a fair in Hamburg and another just outside Frankfurt. Though such a drive would be lunacy, it was hardly without precedent; we had in fact done something very similar two years before. She duly zoned out while I made the most of the Autobahn, completing the 725km journey in just over six hours including a thirty minute break at the half way point. Her brain powered back up a few minutes before arrival just as the lights of the park were coming into view, and her first semi-conscious words reflected her status as a nerdy coaster enthusiast: why is there a B&M hyper coaster at a fair? We spent the night at the Hotel Santa Isabel, one of five hotels attached to Europa Park, and one of the two I'd stayed in previously. In an ideal world I'd have chosen a different one for variety, but they were all completely booked out when I sought a reservation in mid-November, a seriously impressive achievement for a Sunday night outside of school holidays. Our room was beautifully themed, with a cassock in a display case, a painting of Jesus on the wall, a romanesque arch above the bathtub, and in a nod to the season, a tabletop Christmas tree and two chocolate Santas. For all the positives, however, it would be remiss of me not to record that we could not collect our pre-paid park tickets during the check-in process. Instead, the rather dour receptionist told us we'd need to pick them up in the morning alongside the many other hotel guests trying to do the same thing. The resultant thirty minute queue consumed a sizeable portion of the "early entry time" that we were supposed to get as hotel guests, which wasn't the start I'd have chosen for our day. I'm hoping that this was a once-off embuggerance rather than regular policy; if the latter, it is something that really should be changed. When we finally made it into the park our first stop was at Alpenexpress VR-Ride, an interesting new prototype where guests are given virtual reality headsets to wear while riding what is otherwise a not terribly distinguished powered coaster. The inherent limited capacity of this attraction is managed by means of timed tickets that can be bought for €2 from a vending machine close to the ride entrance, though using it requires scanning of a park entrance ticket and that option doesn't work for hotel guests. After a few unsuccessful attempts we gave up and followed the multitudes into the nearby gift shop where we were able to buy the next available slots without difficulty. The front two cars of the train have been dedicated to headset use, and are accessed via a special entrance. On one level it was a little disappointing to see front seat access removed from ordinary riders, but being pragmatic I rather suspect that this decision was forced due to the need to retrofit an extra access route onto an existing station. The original queue now points to cars three through ten, and a movable barrier allows the addition of more headset rows in the future if the demand is there. The headsets themselves are from the Samsung Gear VR family, and consist of Samsung Galaxy mobile phones coupled with some additional hardware, chiefly an inertial measuring unit. The equipment is held securely in place by means of two straps, one around the back of the head and a second over the top. The official VR Coaster site mentions that a chin strap is also available, though this is presumably only needed for coasters with strong negative forces and/or countries with neurotic insurance restrictions. I'd never had the pleasure of trying out a VR headset before, and duly tried mine on experimentally in the queue. The technology worked far better than I'd anticipated; Ed and Edda were waving cheerfully at me, and as I turned my head from side to side and up and down the viewing angle changed, exactly as it would in real life. Initially there were some minor focus issues with the screen, but that was easily fixed; there was a dial on the side that adjusted the image so that it was crystal clear. There was a bit of ambiguity on whether glasses could be worn; on my first ride there was no problem wearing them inside the headset, though on a subsequent lap later in the day I was told to remove them. In reality the variable focus renders glasses largely unnecessary, and given that I decided not to kick up a fuss. As the train dispatches the image inside the headsets crossfades into a rendered world that feels like something borrowed from the Crash Bandicoot series; the two mice are standing on a cart that is rolling through a mine scene, underneath wooden arches and past brightly lit rock formations. The track crosses a river of lava just in time to rescue someone from a derailed cart, then disappears entirely as the fiery cavern we were in mysteriously morphs into an ice world. We skate across the rocks for a while only to end up on the back of a bright purple dragon who flies us to an approximation of the first world from Super Mario 64, complete with lush greenery and perfectly circular trees. The virtual world is entirely unrealistic, yet the technology and the field of vision in the headsets makes it feel otherwise, and the precise synchronisation with the movement of the train eliminates the risk of motion sickness. The experience is very neat indeed, and one that I rather suspect will end up being rolled out at parks around the world in time. That being said, I'd hate to see headsets becoming compulsory, as I like being able to see the outside world while riding coasters. I'm also concerned about the effect headset use will have on ride throughput, especially in corporate parks that are not exactly known for their efficient loading speeds. 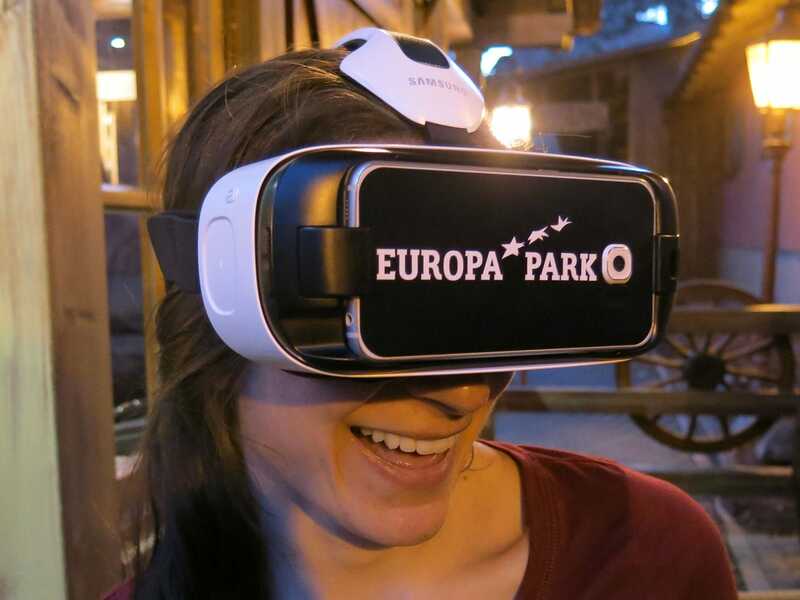 During its winter opening Europa Park hires in a number of third-party attractions to make up for those that cannot be operated in low temperatures. Chief among the additions is the Bellevue giant wheel from Oscar Bruch Jr which is set up directly in front of Atlantica SuperSplash. The presentation of the ride is as expected for a machine from the German fair circuit; the individual cars are painted in an elaborate design, and the seats are lined with red velvet. The location allows a superb overview shot of Blue Fire that is impossible to capture during the summer months. My last visit to the park three years ago was centered around the opening of Wodan, which at that time was brand new. I'd gone into the day with high expectations, but came away underwhelmed by a ride that was both forceless and boring, in sharp contrast to the early test videos that had looked fantastic. It turned out that the root cause of the problem was polyurethane wheels that had been installed to reduce noise, and while they were successful at that, the additional friction had the unintended side effect of neutering the layout completely. As a result of guest feedback it was decided to switch the wheel compounds for the 2013 season, and online reviews suggested that the change had worked, with the once flaccid wood (yes, that phrasing was deliberate) now ranking among the best rides of its type in Europe. I couldn't wait to validate that for myself. Before we could ride, however, it was necessary to walk through the beautifully themed queue. I'd not had the chance to do this previously, having utilised the single rider line on my last visit, and I've got to say I was impressed at the way the designers managed to build a high capacity area without resorting to a cattle grid. Much of the route was outdoors, but there was also a themed section with dark ride imagery that looked great. It would have been nice if there was a gate allowing it to be bypassed, given that it was a quiet day, but that's a small nitpick indeed. There were almost no other guests in the station when we arrived there, and thus we climbed directly into the back seat, from where the ride was quite frankly magnificent. The first drop, which was top notch with the old wheels, was now on another level entirely, with airtime all the way down. The rest of the layout was a bit of a blur, with constant direction changes accompanied by a terrific noise (silencing apparently no longer required!) and intense forces. I've since compared some online videos between the ride in its opening year and now, and the time from the top of lift to brakes has been cut by almost ten seconds, and you can certainly feel the difference. We went for a second lap in front later in the day, and that was excellent too, though I think the back had the overall edge for me. As this was Megan's first visit to the park we elected to work our way around all the significant rides rather than focusing just on coasters. That was how we ended up at Piraten in Batavia, where we were waved into the entrance by a friendly staff member in a bright red nautical uniform. The queue took us past a variety of elaborate scenes that I'd not paid much attention to in previous visits, culminating in a dreadlock-adorned pirate who reminded me very much of Johnny Depp's famous character, though it's worth noting that the resemblance was coincidental; Europa's ride was built sixteen years before the first Pirates of the Caribbean movie was released. We were apparently the first guests of the morning, and thus found ourselves with an entire sixteen-seat boat to ourselves. Our journey took us first to a cave in the Indonesian jungle, home to a variety of interesting species, from where we splashed down a waterfall into a battle scene with gunfire and cannon shots. 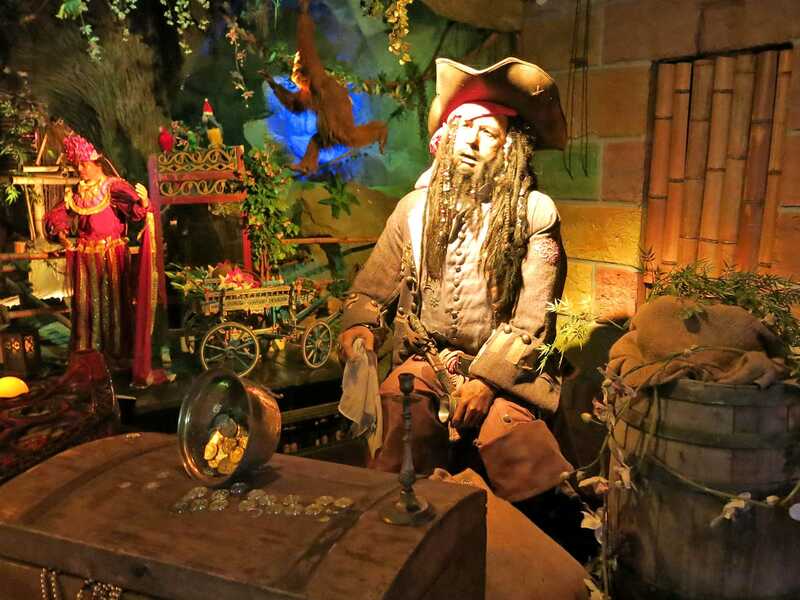 The boat subsequently rounded a corner into Batavia itself, with around a hundred animatronic pirates drinking and being merry. The standard of presentation was excellent, and unlike many dark rides the ceiling had been decorated with fake stars in order to provide a fully immersive experience. In times past the staff on Euro-Mir wore themed jumpsuits emblazoned with a distinctive МИР logo, though these were absent today. Aside from that cosmetic change however the ride was entirely as I remembered it. The trains were made up of four connected cars with back to back seating, and these dispatched into a tiny staging area before engaging a spiral lift hill driven by an enormous rotating barrel mechanism. The climb to the top took almost two minutes, though the time went quickly thanks to a catchy techno dance soundtrack. At the apex, the cars began to rotate slowly along some wild mouse style switchbacks. A locking mechanism left us facing forward for a steep curved drop that went almost to ground level, though on the subsequent climb out one more half rotation left us facing the other way for the remainder of the layout, which was aggressive, intense, and thrilling. The tracking wasn't exactly smooth, but a little license is perhaps allowable for a nineteen year old coaster that on a busy day can run as many as nine trains at the same time. We found ourselves queuing for Schweizer Bobbahn behind a group of elderly people whose idea of walking pace bore little resemblance to that used by the rest of humanity. This allowed almost all of the people waiting in front of them to clear in the quarter of an hour it felt like it took them to walk fifty metres, leaving just a three train wait for front car. A dispatch every thirty seconds or so meant that there was no reason not to hold, and before we knew it we'd taken our place in the bright red Swiss train. The ride was great, and the sensation of speed was maintained throughout the layout in sharp contrast to the rather lacklustre Intamin equivalents. The park is home to an Intamin-built observation tower that nominally dates from 1983, but it actually premiered three years before that in the city of Basel, where it was installed for a major festival. The ride now known as Euro-Tower received a complete refurbishment for the 2015 season with steam-punk theming at ground level that looked far better than the rather drab queuing area it replaced. Unlike many rides of this type we were given several full rotations at the maximum height, allowing us to get all the pictures we wanted in a single pass. Europa Park has for years now been the testbed for new technologies from the Mack Rides factory, and the latest example of this is Arthur, an inverted powered coaster with on-board sound and rotating cars that acts as the centrepiece of a new indoor area themed to Arthur and the Minimoys. The new attraction is more of a dark ride than it is a coaster, but there are three sections of track where the three car trains accelerate to a top speed of 31km/h, allowing those sad enough to count powered coasters to feel good about themselves. Riders are restrained by individual pull down lap bars that feel secure without being restrictive in any way. The experience begins with a projection screen showing what appears to be a typical country mansion with a clothesline and attached barn. The camera gradually moves downwards until it is buried within a flowerbed, and as the car turns around those flowers (now huge) can be seen in animatronic form accompanied by enormous wild mushrooms and a number of small creatures who remarkably enough speak fluent German in a clearly enunciated fashion. Several more garden scenes follow before the appearance of an angry red-eyed monster and an acceleration into about ten seconds of coaster, a brief turnaround outside the main ride building. The train rolls back inside to Paradise Alley, a set of scenes feature gaudy bright neon colours of the sort that one might expect to see in Las Vegas. These exit to a gentle coaster section where the train travels around the ceiling of the Minimoys area. A final dark ride scene located close to ceiling level fills up with dry ice smoke before the longest coaster section, a pair of outdoor helices that take about fifteen seconds to traverse. The train then slows down and passes through what looks like the inside of a honeycomb before coming to a gentle halt back in the station. 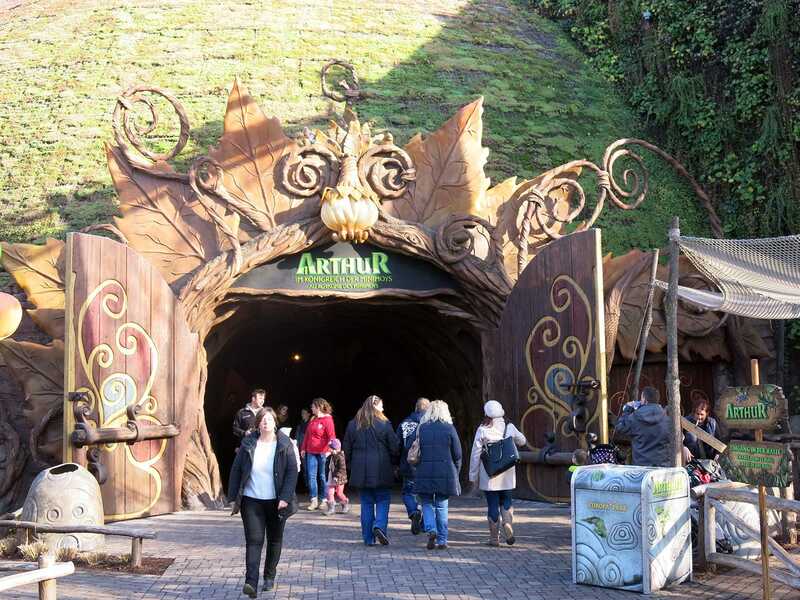 The technology behind Arthur is impressive, and the overall standard of presentation is at the level one has come to expect from Europa Park. 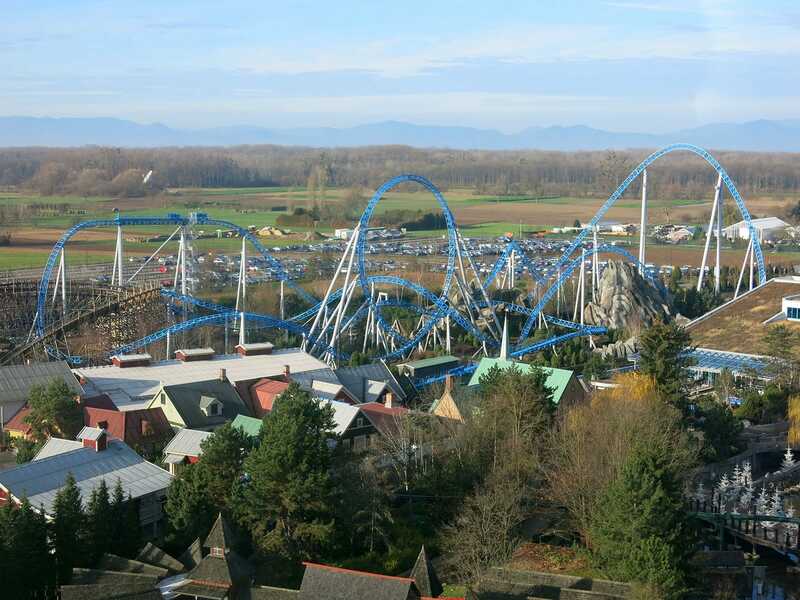 I've got a hard time labelling the experience as a coaster, especially when compared against dark rides with high speed sections such as Droomvlucht, but regardless as how you classify it it is certainly a worthy attraction that would be a welcome addition to any major theme park worldwide. I'm given to understand that the same technology will be appearing in a well-known movie themed park in the Middle East next year, and it'll be interesting indeed to see what is done with it. We continued our exploration with two back-to-back non coaster rides, starting with Abenteuer Atlantis, the target shooter that I described seven years ago as excellent. The silly scoring system I commented on before allowed me to clock up a very similar total to Megan despite the fact that I spent two thirds of the ride admiring the scenery and taking photographs, as I hit a high value target early on. I found myself wondering whether this might be a deliberate feature to allow park regulars to always win against those riding for the first time, but if so the implementation felt a bit clumsy. From there we went to Fluch der Kassandra, the original Mack Revolving House and a relative rarity compared to the much more common Vekoma version. Unlike most rides of its type, this unit includes additional effects beyond the rotating room, including vibrating seats and air bursts, all accompanied by a dramatic soundtrack that remains one of my favourite pieces of park music. 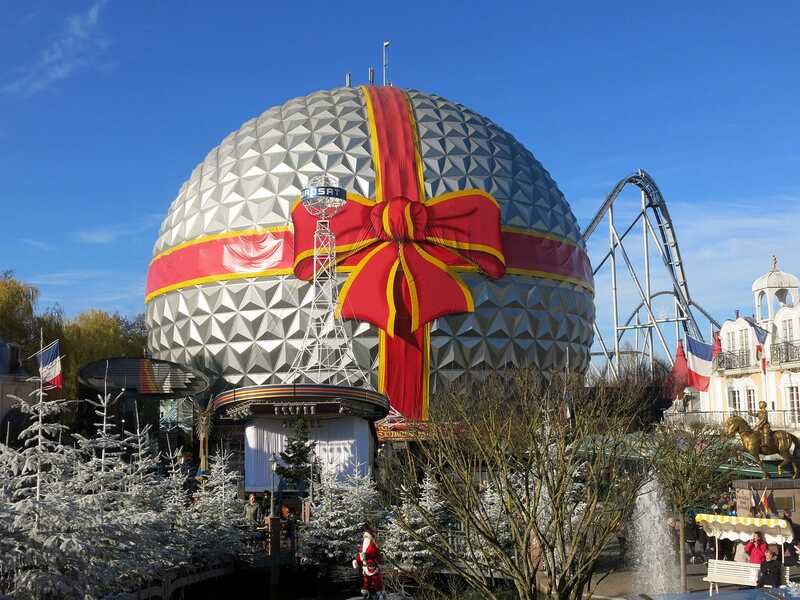 The domed building that houses Eurosat had been dressed for the season as a wrapped Christmas present and the result looked fantastic and considerably more refined (if somewhat less striking) than the Halloween theming from a few years ago. The coaster inside was every bit as good as I remembered it, with a fantastic soundtrack and a layout that maintained its sense of speed from the top of lift to the final brake. A few years ago I was privileged to ride with the work lights turned on, and I'd like to do that again at some point; in the interim there's a wonderful video online that shows off the tangled layout rather nicely. The only disappointment of the day was Matterhorn Blitz, a custom wild mouse with a themed queue and a tilting vertical lift that deserved to be far better than it actually was. The main problem was the sheer number of brake segments; every time the four seat car picked up any speed it would slow to a near halt before continuing. The experience felt decidedly limp in comparison to the magnificent Wilde Maus we'd ridden less than twenty-four hours before, which is unfortunate really given that this unit should have been a showcase for Mack Rides. We were on our way to the haunted house when we spotted dark ride vehicles under a sign for Piccolo Mondo, and it'd have been remiss of us not to investigate. It was a treat to discover an Italian-themed version of Disney's It's a small world, featuring four-seat cars in the shape of gondolas with Enzo the Parrot as tour guide. The route took us past a scene depicting the painting of the Mona Lisa, followed by an unidentified theatre, a bridge in Venice, a chef cooking pizza, and Carnevale. I subsequently learned that the ride dates from 1982, making me wonder just how I'd managed to miss it on all eight of my previous trips to the park! 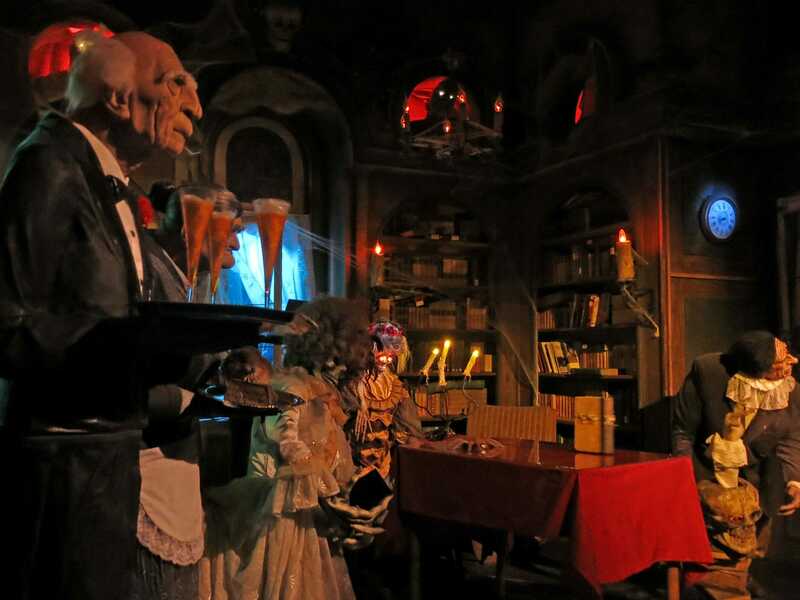 We disembarked and headed straight into Geisterschloss, a ride very clearly inspired by Disney's Haunted Mansion, with a similar omni-mover system and hugely detailed scenes that were for the most part equivalent to the better known ride. The ride soundtrack was heavy on organ music, which for some reason is invariably considered to be spooky; I'm not quite sure why this is the convention, as it's possible to play very silly non-spooky music on the organ, and if you'd like to help a good cause (and one that's very close to my heart) you can learn that for yourself! Pegasus was the debut installation of the Mack YoungStar coaster, and today was an excellent opportunity to see how the hardware was holding up after ten seasons of operation. Perhaps unsurprisingly the answer to this was very well; the track was as smooth as it was when I first rode it almost ten years ago. The only thing I didn't like was the figurehead on the front car, which was sufficiently large to completely block the view for young children (and indeed smaller adults). We decided on a mid-afternoon meal at the Food Loop restaurant, now one of several outlets worldwide to deliver meals by roller coaster. There was a short wait for a table, but we struck gold when we ended up with one whose feeder track included a vertical loop. There was an incredible temptation to order additional items just to watch them being delivered, which presumably helps overall profitability. If any of my videographer friends are reading this, it'd be fun to see an on-ride video. How about it? The final stop of the day was at Blue Fire, and we arrived just as the daylight was beginning to fade. This meant near perfect conditions for photography, and we ended up spending several minutes capturing sunset photos before joining the queue. The pathway brought us past some fairly shameless advertising for Gazprom presumably geared at Russian visitors, but of limited interest to those of us from outside the CIS. The presence of Cyrillic reminded me of the clone of this ride at Wonder Island with the somewhat improbable name of Velikoluksky Meat-packing Plant. But I digress. We selected a back seat for our first ride, and pulled down the overhead lap restraints, which had embedded heart rate monitors whose output bore absolutely no relation to reality. The train dispatched and rounded a corner through some dark ride scenery before launching smoothly to its top speed. From there, the layout was a mix of hills and inversions that were negotiated without any particularly memorable forces, barring a touch of hangtime. We subsequently went back for a second lap in the front which also seemed a bit understated, though it was quite cold so the speed may have been reduced.